BOB’S law office is more or less like any other law office. We see BOB sitting behind his large desk, various diplomas and fine art prints. On his desk sit a nameplate, various photographs of loved ones, a small paper-shredder and other desk toys and geegaws. On the other side, we see DORIAN and TOM sitting down facing BOB. So, Bob, do you think we can do this? Well, I guess so. It’s, as I’m sure you’re aware, highly irregular. And, well, rather illegal. Hmm. Well, first off, we should put it in my will. I’d feel better. It’ll make it a little more legitimate. Well, as legitimate as something this stupid could be. I guess. Still, though, it doesn’t really matter that much. Something doesn’t become magically legal because it’s someone’s last request. So, uh, how do I do this? Can I just tell you what I want to say, and you can put it up into lawyer-ese later, and then I can sign it? All right. 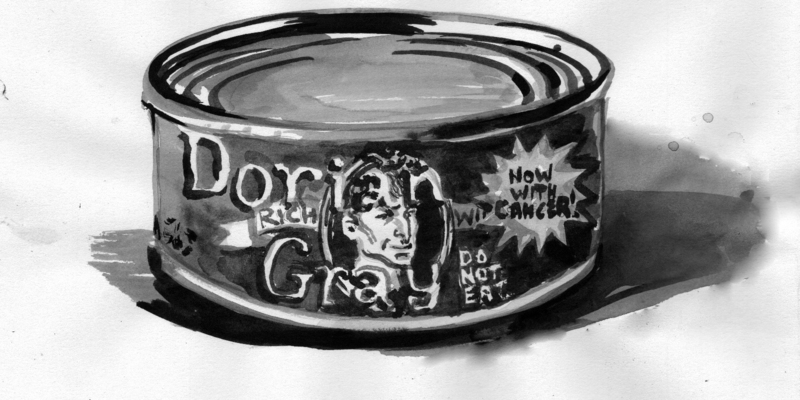 I, Dorian Gray, being of sound mind and body, aside from the whole cancer thing, want my corpse to be chopped up and put into tins. Then, I want the tins distributed, with labels that I’m working on having made glued on, at my funeral. So everyone can take me home with them. With all my possessions, whatever’s left, I want to have liquidated, and then split up evenly amongst everyone who shows up at the funeral. And I want Tom here, uh… what’s your last name again? Howesebury. Remember? All those times in class? When we’d go into roll call, and the teacher’d call out your name right before mine? Gray, Dorian? Howesebury, Tom? Remember? Y’know, when your parents decided that public school would be good for you? Am I ringing any bells at all? And I want Tom Howesebury to be the executor of my will. Oh yeah, and before my stuff’s liquidated, I want to give my maid my CDs. (pauses) I’ll get back to you on that. Anyway, that’s it. Tinning, liquidation of assets, Tom executor. Oh yeah, Bob, just take your fees and stuff off the top of the liquidation thing too. It’s customary for your lawyer to be the executor of the will. Yeah, Dore, I don’t want to do it. I said it, and it’s final! Tom, you’re doing it! And you’re going to like it! Hey, Bob, uh, as my first act of executor-ing, can I make you executor? Oh, no you don’t! You’re not getting out of it that easy! OK, I’ll draw this up (pauses) later. Anyway, back to the task at hand. How, erm, how exactly are you thinking about doing this? Well, that’s why I’m here, I need advice. How do you think we should go about getting this done? At this point, BOB stands up, and takes down all his diplomas and Bar Certifications and other official certificates, and chucks them all in his bottom desk drawer. I’m going to tell you that your best bet is to see about going about it sort of, well, under the table. See if you can find someone who’ll accept the money on the Q. T., and go through with this. But, well, this isn’t exactly terribly likely. Since, well, if it got out, they’d probably be closed down. Seriously, Dorian, I’d work on a more (pause) traditional (pause) method of (pause) disposal. If you don’t mind me putting it like that. Nope! Not at all! Although, uh, what can you do for me? Well, I can draw up your will. And, well, I might be able to act as an intermediary of sorts, should you find a plant that would actually take you up on your offer. In the meantime, well, just keep an eye out for tinning plants that are shutting down, I guess. If anyone was going to help you out, it’d probably be them. Have you done any research yet, at all? We see DORIAN gazing up at the reflective building in awe, as if he’s just seen Valhalla. TOM is looking at the building too, but he just sees a cannery, nothing more. This. This is where I want to be my penultimate resting place. It’s so wonderful. I can see myself in the side of the building! That’s so much class. This is it. Well, I suppose it is nice, y’know, for a place where they put fish into small cans. Don’t rob it of its dignity like that! The lobby looks how you’d expect the interior of a modern building to look, providing that building wasn’t actually a cannery. Behind the large wood desk is a RECEPTIONIST. DORIAN is still visibly excited. TOM is bored and vaguely uncomfortable. He occasionally sniffs the aroma of pungent fish in the air. He tries to hide his distaste for the smell, as to not offend the RECEPTIONIST. Uh, hi, I’m Dorian Gray. I’ve got an appointment with the president? Yes, sir. His office is on the 50th floor. Go right in. DORIAN and TOM are the only two in the elevator. DORIAN is twitching with glee and anticipation, like he’s going to meet his favorite celebrity. TOM is just standing still, looking up at the numbers above the door. The elevator doors on the 50th floor open, and DORIAN and TOM step outside. They see a long corridor in front of them, and a SECRETARY behind a smaller, but elegant desk in front of a larger, heavy door, labeled “Franklin J. Steeverson, President”. DORIAN and TOM approach the desk. DORIAN’S nervousness is beginning to overtake his anticipation. Dorian Gray? Mr. Steeverson is waiting for you. The SECRETARY gets up and opens the door, and motions DORIAN and TOM inside. MR. STEEVERSON is an older man, about 60 years old, sitting at an incredibly large desk. His office is full of fine art and sculpture – but originals, not prints, as in BOB’S office. Howesebury. How are you doing, sir? I’m doing well, thank you. What can I do for you? MR. STEEVERSON gestures to chairs that are dwarfed by the size of his desk. DORIAN and TOM sit down. So, Mr. Gray, you’re looking well, how’s that portrait holding up? Well, you’re Dorian Gray, aren’t you? Haven’t you ever read that story? The one you’re named after, of course! I (pause) can’t say as I have, sir. No matter. Just if I were named after a famous story, I’d read it. Anyway, what did you want to see me about? Well, uh, sir, I’m dying of cancer. I’ve got about six months to live. Oh, I’m sorry, that’s an unfortunate blow. How are you holding up? I hope it’s not too dreadfully painful. Actually, I’m feeling fine, I don’t hurt a bit right now, but, well, what I wanted to talk to you about was, well, my final plans. Oh, do you need some help to pay for the funeral expenses? I’m sorry, Mr. Gray, but we’re not a charity. Oh, no, sir, you misunderstand. I’m quite wealthy. Well, then, what exactly do you want? We’re a cannery, you realize. Well, sir, my final wish is, well, it’s a bit out of the ordinary, you see. I mean, I took the tour last week of your facilities, and well, it’s beautiful. Why, thank you, young man. I’m glad you enjoy my humble cannery. Oh, don’t think of it like that sir, it’s very nice; it’s the best cannery I’ve ever seen! Which, well, I guess brings me to my request. Well, uh, I’d like to be tinned. I’d like to, uh, when I die, uh, I’d like to be, well, processed and put into tins. Like you do with the fish. MR. STEEVERSON looks at TOM, who is just sitting in the chair, somewhat embarrassed, looking at his fingernails. Is this some sort of prank? You can’t be serious. No, I’m 100% serious, sir. I’m, well, I’m a big fan of your business, it’s so clean and well-maintained, that, even though I could be tinned at any of the canneries in the area, it would be an honor to be a Felpak tin to be my final home. What possible reason could you have to be tinned? Sir, my plan is to be tinned, and then, at my funeral, to be able to give away my body to all my friends. Like cremation, only without the selfishness. Mr. Gray, you can distribute the ashes however you want when you’re cremated. Yes, but when they give you the ashes, they don’t have any way of separating the ashes that are just you from the other ashes. It’d be dishonest if one of my friends thought they were getting me, but they were getting someone else entirely. This way, they’d know it was me, and that it was only me. This is one of the most disgusting things I’ve ever heard! How do you expect that we do this without contamination? I’ve thought about that, and I would have a portion of my estate set aside for Felpak to clean the machinery thoroughly before and after, so as to not contaminate either my tins, or the tins you make afterward. So, not only would I pay for the materials for the tins themselves, and the delivery, but also for the labor and the cleaning of the machines, and of course, the replacement of any parts that get damaged from my bones. I’m glad you’re so thoughtful, Mr. Gray, but you couldn’t possibly think that we’d go along with this. No one would have to know! It would be a secret operation! I wouldn’t advertise the funeral or anything, and only my close friends would know of the quality job your plant would do on this job. You may even get some customers out of the deal! Mr. Gray, I cannot allow you to use my plant as a place to promote cannibalism! Cannibalism?! Sir, people would be strongly advised against eating me. STRONGLY advised. After all, not only do I have many impurities in my blood and meat, not being raised for consumption, I’ve also got cancer, and, well, that can’t be good. Please get out of my office, and stop wasting my time. Please, sir! Please! This is my dying wish! Sir, please! If you just set a price, I’ll pay it! I’m desperate! Please let me be a Felpak product! Please, sir! This company is so beautiful! Let me be processed here! Please, sir! Just let me do this! It’s the one thing I want! By this time, DORIAN is fighting back tears. I beg of you, sir! I wouldn’t ask, if I didn’t have the utmost respect for your fine company! Please, sir! TOM grabs DORIAN and drags him out of MR. STEEVERSON’S office. DORIAN is all but crying on the way, and continues to plead. Mr. Steeverson, sir, I apologize on behalf of my friend. Out! Get out! Now! Out!